Several people have shared with me recently how they have seen River Otters on their farms or in waterways by their homes. Otters have been increasing in population in Kentucky due to conservation efforts. Otters are mammals that live in ponds, rivers, and creeks throughout Kentucky. They are a member of the weasel family and are related to weasels and minks. The River Otter (Lontra canadensis) is a semi-aquatic otter with a long, sleek body and thick coat that protects them in the cold water. The entire body is brown with a bit of grayish white around the muzzle and chin. They can remain under water for four minutes. They are active all year and do not hibernate. They are nocturnal and crepuscular (out at twilight) during spring and summer. During fall and winter they become diurnal and are easier to see during the day. Otters live an average of nine years in the wild. Adult otters weigh approximately twenty pounds but can weigh as much as thirty pounds. Males are slightly larger than females. Otters are active all year. Otters live in polygamous family groups in dens along water ways. They typically will dig a burrow into the bank near a pond or waterway. The burrow has several openings with one under the water. The main family consists of the female and her offspring with one or two males usually present. Their may also be unrelated helper members. Adult males may live in a den together as a social group. Male otters are not territorial and young males may join up with other male groups. Otters communicate through a variety of vocalizations and scent marking. Otters become sexually mature at two years of age. Breeding occurs between December and April. Gestation lasts from 61 - 63 days and young are born from February to April. The female gives birth to three or four babies inside the burrow. The babies are called pups and weigh about five ounces when born. 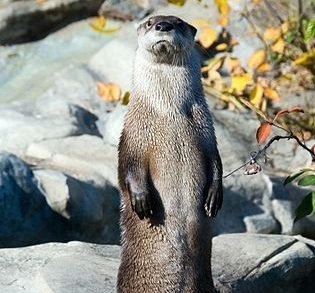 What Otters in Kentucky Eat? Otters are predators and carnivores and hunt for prey. The eat fish, amphibians such as frogs and salamanders, as well as mussels and turtles. They will occasionally eat small mammals and birds such as baby rabbits or young ducklings. 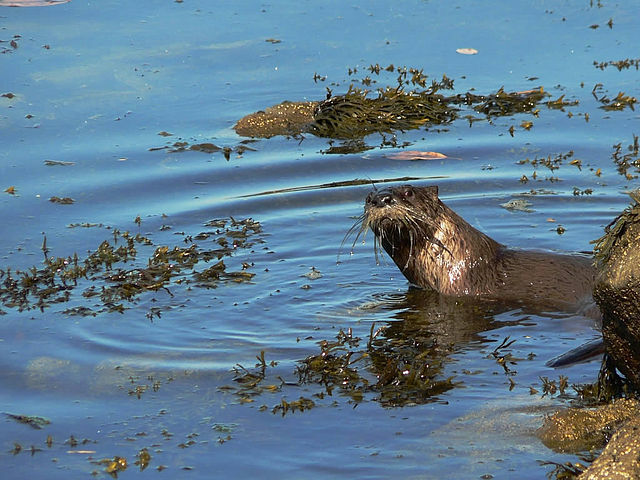 A recent study, conducted by Dr. Michael Lacki of the University of Kentucky , found that otters ate predominately fish and crayfish. This study reflects a winter diet. The most common fish species were, crappie, sunfish and black bass. Suckers, minnows and shad were also consumed. Otters bodies are perfectly suited to hunting in their water environment. They have long aerodynamic bodies with a long tail and webbed feet which allow them to propel themselves swiftly through the water. Their whiskers are very sensitive and help them to find prey underwater. Otters have excellent senses of smell and hearing. They have poor vision and are near sighted, which is why they may come close to you and check you out. Otters have “nictitating membranes” or a third eyelid, which acts as a film that covers their eyes when they are under water. Otters are curious and playful, making them a fun species to observe in nature. Winter is the best time to spot them as they are out more in daylight looking for food. Observing safely from a hill or bank overlooking the water is best as otters can display unpredictable aggressive behavior. In spring, young otters come out of the den. They learn survival skills by wrestling and chasing each other. Otters enjoy going down a mud slide into the water and have been observed playing with small pebbles and shells. Due to trapping, water pollution and habitat loss the population had declined by the early 1900’s. In fact, the population was so low they were considered endangered. Starting in 1991, The Kentucky Department of Fish and Wildlife joined twenty one other states to reintroduce otters in native territory. Wild otters from stable populations in Louisiana were trapped and relocated to Kentucky. 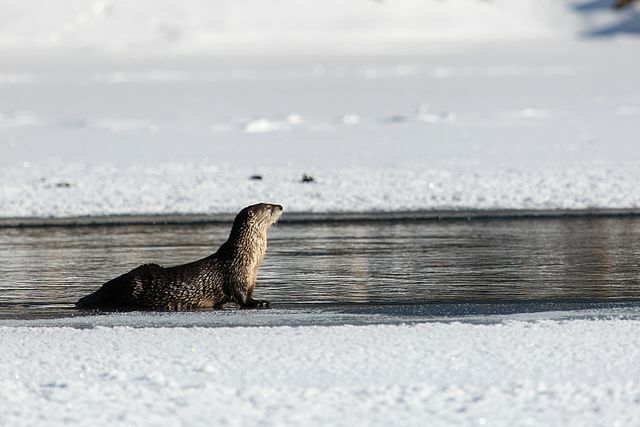 The otters were taken to fourteen different locations along Barren,Big Sandy, Green, Kentucky, Licking, and Salt Rivers. These areas continue to have healthy otter populations and KFW has allowed trapping to resume with limitations. South Eastern Kentucky has a low otter population which may be caused by increased water pollution and changing land formations due to coal mining. Otters have webbed feet with long claws. Otters are nearsighted – one reason they may come close to you to take a look! Otters are very mobile and can travel 25 miles in one day. Otters can swim 7 miles per hour. Otters can experience “embryonic diapause” a reproductive strategy which holds the fertilized egg in a dormant state until implanting in the uterus, sometimes a year later. Otters can stay under water up to eight minutes. Otter pups tend to end up in rehabilitation during the stage where they are just starting to explore outside the burrow. Occasionally, they become separated from mom due to predators, flooding, or moms death via trapping. They may come up to people and appear tame because they are hungry. Contact your nearest wildlife rehabilitator or the Department of Fish and Wildlife. Otters can be successfully rehabilitated and returned to the wild as juveniles. If an adult otter comes up to you use caution. They may be friendly because people are feeding them, however that does not mean they are safe to handle. Otters do bite. Another reason they appear friendly is because they have distemper. Please consider becoming a member of Fox Run Environmental Center and helping us to save lives. Otters do eat fish and sometimes come into conflict with sport fisherman and fish farmers in the region. They often eat non game fish but will eat bass and trout, both popular with humans. If you are having conflict with otters getting into your pond or creek you can fence off the area using a 4’ high fence with 3 inches spaces or smaller. Otters do not climb or jump well. In addition you can provide hiding places for your fish population by sinking conifer trees or slated baskets at the bottom of the water. Otters rarely go into farmyards to attack poultry like their relative the mink. The otter’s larger size and webbed feet makes them ungainly on land. Otters are very sensitive to water pollution. 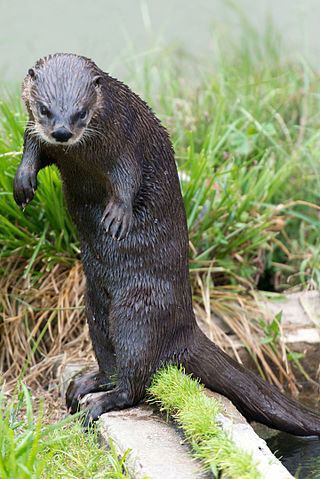 One way to improve otter habitat is to curtail agricultural and chemical run off into your pond or stream. The obvious answer to this is to use only organic methods. If you are a commercial farmer this can be done by using grass and woods buffers around fields. This helps to prevent erosion of agricultural chemicals. Preventing stream erosion by fencing off livestock areas and not driving your four wheeler through water ways helps to keep the water clean. Ame Vanorio is the founder/director of Fox Run Environmental Education Center in Falmouth, Ky. We teach environmental education programs and serve as a licensed wildlife rehabilitation center. Text us with wildlife emergencies at 859-242-1037.